Sentiment is very, very bearish on the dollar, and an important development just transpired when Lazard just moved to change their funds from trading in dollars to Pounds Sterling. A move that throws the middle finger to Bernanke and to the U.S. dollar, more funds may follow. This is a pretty hazardous gambit, actually, when you consider that just this morning Britain saw further deterioration in growth and admit that more quantitative easing (printing) may (will) be necessary (foolishly). 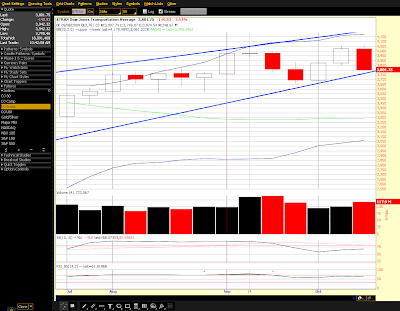 Note that on the SPX that the rising wedge is terminal right on the bear market downtrend line. That line has so far proved to be resistance. Odds are very high that those wedges will break in the traditional, opposite trend direction, meaning dollar higher and equities down. The next highest odds would be to see the very worst case and that would be a falling dollar alongside falling equities – that would not be good, it would be a disaster, and moves like Lazard’s make it a higher probability than before. The lowest odds are that they would both break in the opposite direction expected, something that concerns me for no other reason than they are so obvious and that so many people see them. Truly a place to be careful. 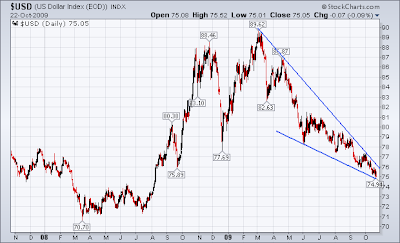 Another pattern to watch is a rising wedge in long term bonds. The long end of the curve is forming a rising wedge and /ZB is now challenging the bottom of that wedge as I charted in this morning’s update. 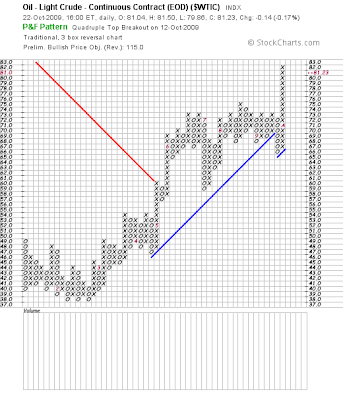 Oil broke out above $80 causing the Point & Figure diagram to issue a $115 a barrel price target! Again, we all better hope that doesn’t really happen. These charts are often right and should not be ignored, however, they are not always right and I would be very careful being long commodities here, especially if the dollar does rise and break that upper wedge boundary. Today’s action by the wave count is close to ending the middle stroke of an abc move. There should be one more wave higher by the most likely count (with small subwaves). 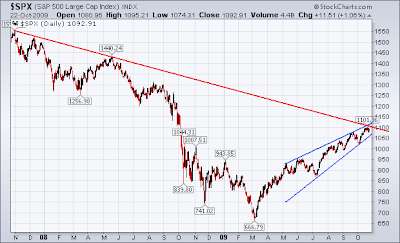 However, there are HUGE cracks and divergences developing in the markets. The divergences are historic in size, volume being the most noticeable. Another standout are the Transports. They have retreated strongly from their recent intraday highs after BARELY making new highs. Unless there is a very strong bounce this afternoon, the weekly candle on the Transports is going to be a bearish engulfing candle. 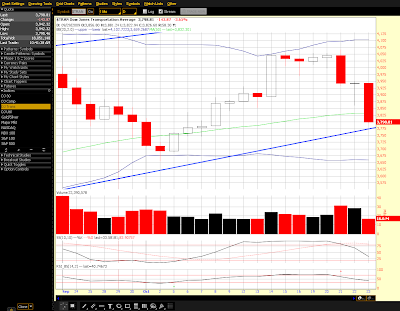 Below is a 3 month weekly and one month daily chart of the Transports. You can see in the Transports that we have a fresh sell signal on the daily and are likely to close below the 50dma, just above the rising wedge bottom boundary, again, unless a late day large bounce occurs. Of course the entire market is dramatically overbought and overpriced. Earnings are touted as being strong and “much better than expected.” That is mostly hype and ignores the historic collapse in revenues across the board. There are many signs indicating that credit is still tightening, another credit freeze is certainly NOT off the table and is, in fact, a high odds likelihood from my perspective. Bottom line is that by the wave count there is likely to be another push higher, but the cracks are mounting and that last wave does not have to occur… that is why we use other indicators such as trendlines to tell us when direction has changed.